(FNA)- The Syrian army and its allies made significant advances against the ISIL terrorists in the Central province of Homs after seizing back more key areas in the vicinity of the ancient city of Palmyra (Tadmur). The terrorists sustained heavy losses in fierce clashes with the Syrian government troops near Palmyra city. Meantime, the Syrian army and popular forces continued their military advances in other parts of Syria, including Damascus and Deir Ezzur, over past 24 hours. The Syrian Army troops, backed up by the Russian and Syrian fighter jets, started a fresh round of anti-ISIL operation to the West of ancient Palmyra (Tadmur), capturing more lands in the region. The Army soldiers engaged in fierce clashes with ISIL near T4 airbase and al-Bardeh region, killing a large number of terrorists and driving the rest of them out of more positions in Eastern Homs. The Syrian and Russian warplanes carried out tens of combat sorties over ISIL’s gatherings and movements near Palmyra and energy fields near the city and al-Bardeh. Meantime, a military source said that the ISIL is after capturing T4 airbase and then the town of al-Quaryatayn, but the Syrian and Russian warplanes have foiled plans of terrorists in preemptive strikes. According to another military source, the first phase of the army’s special operation in Eastern Homs is aimed at capturing the Jazal mountain and Al-Maher gas gields to liberate these sites from ISIL’s control. The Syrian Air Force targeted one of the most important bases of the Fatah al-Sham Front (previously known as the al-Nusra Front) in Northern Dara’a, and destroyed the base and militants’ equipment. The army aircraft bombed Fatah al-Sham’s base to the West of the town of Dael, destroying the base and killing or wounding almost 45 terrorists. After the liberation of the strategic town of Sheikh Meskeen, a preliminary agreement was concluded between the Syrian government and militants in the towns of Dael and Ibtta in the Southern side of Sheikh Meskeen in order to pave the ground for the militants to hand over their territories to the government without clashes, but differences among the militant groups pushed the agreement into failure and caused the army men to restart their military operation in the region. Syrian Army troops’ rapid advances against terrorists and wining back the villages of Basimeh and Ein al-Fijeh have paved the way for the reopening the flow of drinking water from Wadi al-Bardi to Damascus. The army soldiers that engaged in fierce clashes with terrorist groups in Wadi al-Bardi region in Western Ghouta took full control over Basimeh and Ein al-Fijeh, while terrorists pulled back forces toward the village of Ein al-Khazra. The army men were involved in an intense battle with terrorists in Ein al-Khazra, forcing the militants to leave their positions in the village. The army troops’ advances will soon enable maintenance groups deployed in Ein al-Fijeh region to repair its water facilities. Syrian Minister of Waster Resources Nabil al-Hassan underlined that maintenance groups had entered Ein al-Fijeh and would start fixing the water facilities in the region. Local sources, meanwhile, said that water pumping operation have started after several hours of work by maintenance groups in Ein al-Fijeh, adding that water will soon come back to Damascus residents. Meantime, the Syrian Army troops continued their advances against terrorist groups in Eastern Ghouta and won full control over a key town in the region. 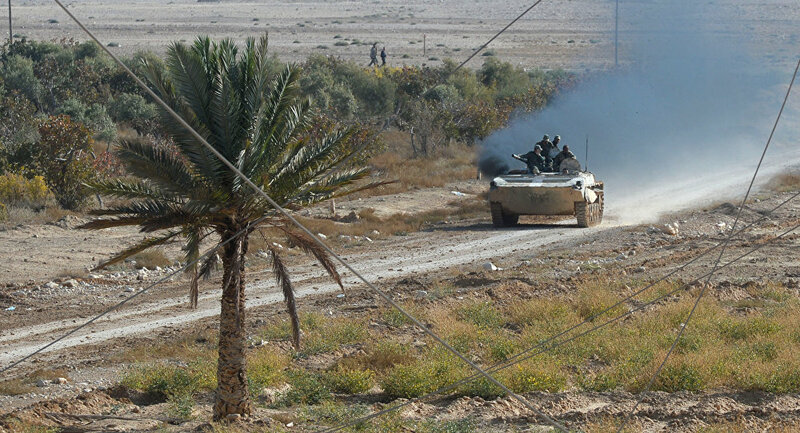 The army soldiers engaged in hours-long clashes with terrorists and drove them back from the town of Hawsh al-Zariqiyeh. Sources affiliated to militant groups disclosed that rebels in the region near Hawsh al-Zariqiyeh avoided sending reinforcement to the town after they were informed of the army advances. A field source said that the terrorists have suffered a heavy death toll in Hawsh al-Zariqiyeh, adding that the army units are about to continue their advances towards Tal (hill) Farzat, while other units will move towards al-Nashibiyeh. But, some reports said that terrorists have targeted the regions near water reservoirs halting repairing process. The Syrian Army raised the flag of the Syrian Arab Republic over the al-Fijeh Springs on Saturday, marking the first time in 4 years that this site has been under government control. Militant groups captured the Wadi al-Bardi region in 2013 after an attack on this water rich part of Western Damascus, and since then they have frequently blocked the water flow to nearly 5 million civilians in Damascus for living under the Syrian government’s protection. Terrorist groups have increased attacks on each other across Idlib province, while terror operations against commanders have been on the rise in recent weeks in the militant-held regions in the province, local sources said. The sources said that senior Commander of Fatah al-Sham Front (previously known as the al-Nusra Front) Abu Ali al-Tunisi was killed in a terrorist attack on a road to the town of Qemaynas in Southeastern Idlib. At least 20 Turkistani terrorists were killed in an attack by rival terrorists on a building in Jabal al-Arbaeen in the town of Ariha, they added. Ahrar al-Sham and Fatah al-Sham are accusing each other of being the main cause of disunity and insecurity in Idlib and its countryside. Ahrar al-Sham believes that Fatah al-Sham’s opposition to merging militant groups is the cause of disunity and insecurity. Al-Omar, one of the commanders of Ahrar, said those members of ISIL that are now among Jund al-Aqsa and have made allegiance to Fatah al-Sham are in charge of insecurity and terror in Idlib. (FNA)- Military sources said ISIL has started retreating from large swathes of land in Eastern Homs after its militants came under massive artillery and missile fire and sustained heavy casualties. Also, the ISIL suffered a heavy death toll and its military hardware sustained major damage after its attack on government positions in Eastern Homs was warded off by the Syrian Army troops on Tuesday. The army soldiers fended off ISIL’s offensive on their positions in the town of Jubb al-Jarrah, killing a number of them after hours of heavy fighting. In the meantime, other units of the army targeted a gathering of ISIL in the Eastern direction of the Fourth Station West of Palmyra (Tadmur), leaving tens of militants dead and their vehicles destroyed. MOSCOW, December 15. /TASS/. Syrian troops have returned the situation in the area of Palmyra to stability with Russian air support and are getting ready for a counter-offensive, the deputy chief of the Russian General Staff’s main operations directorate, Lieutenant-General Viktor Poznikhir told a news briefing on Thursday. “The Syrian troops have returned to stability the situation near Palmyra with Russian air support. Repeated attacks by militants of the Islamic State (outlawed in Russia) have been beaten back. At the moment the defense line lies in the area of the town of Tyas and Tyfor airbase. Russia provides assistance to the Syrian leadership in its preparations for a counterattack on Palmyra,” he said. Islamic State gangs attacked Palmyra last Friday, December 9. The militants tried to seize oil wells and an air base near the city. In the evening of Sunday, December 11, government troops had to leave the central part of the city. The Syrian army retook Palmyra from the Islamic State on March 27 with assistance from Russia’s aerospace group. Russian sappers later helped clear the city and ancient monuments of mines and unexploded ordnance. The Syrian army’s small arms and damaged military hardware that could have fallen into the hands of militants in Palmyra pose no threat to the US-led coalition, Russian Defense Ministry spokesman Major-General Igor Konashenkov said earlier. The Russian general thus commented on a statement by the commander of the international operation against the Islamic State (outlawed in Russia) in Iraq and Syria, Lieutenant-General Steven Townsend who had said on Wednesday that the Islamic State could have seized the armor, small weapons, heavy armaments and, possibly, air defense means in Palmyra. “An insignificant quantity of small arms and several pieces of damaged military hardware left by Syrian servicemen in Palmyra cannot pose any threat to the international coalition,” the spokesman said. “What should really bother General Townsend is the recent decision by the US Congress for the delivery of US man-portable air defense missile systems to Syrian militants in 2017. It is not difficult to understand in whose hands they will fall after their delivery to the Syrian territory. If someone beyond the Ocean hopes that this is a weapon of selective action and can be used only against the aircraft of one side, these are amateurish dreams,” he said. “Sooner or later, they bite off a hand of the giver. All this should concern General Townsend as a military professional,” Konashenkov said. VLADIVOSTOK, July 18. /TASS/. The Guards missile cruiser Varyag, the flagship of the Russian Pacific Fleet has returned to Vladivostok port after a nine-month voyage during which it was involved in the Indra Navy naval exercises in the Bay of Bengal and provided air defense cover to Russia’s Hmeymim airbase in Syria, the press service of the Primorsky Territory administration told TASS on Monday. “On behalf of the Pacific Fleet Military Council, on behalf of the Eastern Military District troops commander, Colonel General Sergei Surovkin, I thank you for the successful completion of responsible missions in the remote area of the World Ocean. The crew has fulfilled all the set combat tasks. What is more, after the return the crew members took part in large-scale Pacific Manoeuvers in the Sea of Okhotsk, demonstrating the highest combat readiness degree, successfully coped with the difficult combat exercise tasks. We are certain that you will never disgrace the guards flag on your flagstaff,” the administration quotes Pacific Fleet Commander Sergei Avakyants as saying. The Russian pacific Fleet flagship was met at the quay by the command of the Primorskaya Flotilla of Multiple Forces, Pacific Fleet veterans, representatives of the Primorsky Territory administration, Vladivostok officials, as well as the crew relatives. According to the fleet’s tradition, the Varyag cruiser Commander, Captain 2nd Rank Alexei Ulyanenko was presented with a roasted piglet. An award ceremony was also held: Alexei Ulyanenko was awarded a Certificate of Merit and the Russian President’s Commendation, and a number of officers, warrant officers and contract servicemen were handed the “Participant in Military Operations in Syria” Medals. The Guards missile cruiser Varyag has returned from a nine-month long voyage. The warship’s crew has successfully fulfilled its tasks during the Indra Navy naval exercises conducted in the Bay of Bengal in collaboration with the Indian Navy. 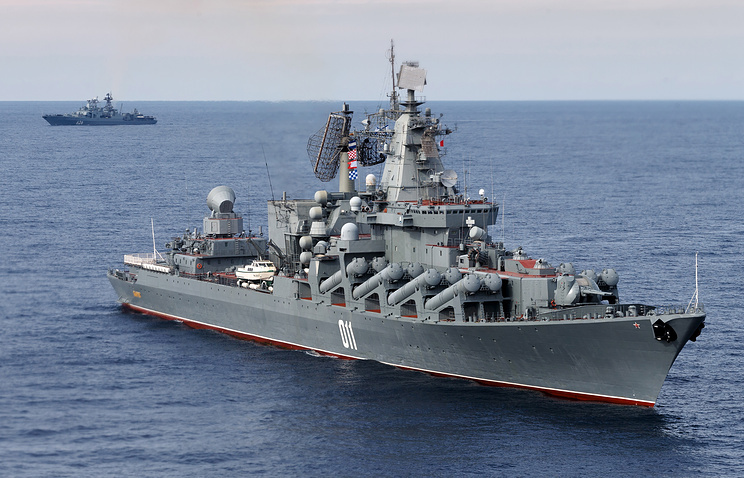 After that, the Varyag, replacing at the coast of Latakia the flagship of Russia’s Black Sea Fleet – the missile cruiser Moskva, provided the air defense cover for Russia’s Hmeymim airbase in Syria. A ceasefire regime is currently in effect in Syria. Russia takes an active part in the Syrian settlement effort. It helps Syria’s authorities fight terrorists and has conducted mine clearing work in the ancient city of Palmyra. Russia’s Aerospace Forces started delivering pinpoint strikes in Syria at facilities of the Islamic State and Jabhat al-Nusra, which are banned in Russia, on September 30, 2015, on a request from Syrian President Bashar Assad. On March 14, 2016, Russian President Vladimir Putin ordered to withdraw the main part of the Russian Aerospace Forces’ group from Syria. Putin said the tasks set before the military “have been fulfilled on the whole.” Russian Deputy Defense Minister Nikolai Pankov said strikes on terrorists will continue to be delivered. Daesh Palmyra Assaults: Syrian Tactical Blunder or American ‘Plan B’? In its analysis of the recently-intensified Daesh assaults to the east of Palmyra, Russian media have noted that they might be due to government forces having redeployed from this area to Aleppo, intentionally weakening the area; however, it say, their tactical blunders should not be safeguarded with the lives of Russian servicemen. In recent days, Daesh (ISIL/ISIS) militants have continued their assault on Syrian Arab Army (SAA) positions in the desert east of Palmyra, according to an analysis of the Russian online newspaper Vzglyad.The outlet also refers to the recent downing of a helicopter carrying two Russian pilots which resulted in the death of both Russian servicemen. Russia responded to the deadly attack with airstrikes; Russian Tu-22M3 strategic long-range bombers were able to destroy a large terrorist encampment, three ammunition depots, three tanks, four armored vehicles, eight cars equipped with heavy machine guns as well as a large number of terrorists. The newspaper therefore suggests that the Syrian General Staff has intentionally weakened its group near Palmyra by redeploying additional units to Aleppo and Damascus province. It notes a successful assault the SAA conducted with the help of the Hezbollah units on leftover Al-Nusra Front units in Damascus’ East Ghouta. At the same very time, it says, the government forces have intensified an assault on jihadists in Aleppo. The outlet notes that while the attack on Aleppo, with the help of the Russian air strikes, looks more or less reasonable and successful, the General Staff could have well waited with the operation in East Ghouta, a region of Greater Damascus.It argues that in order to succeed in these operations, Damascus has to redeploy a considerable number of units, exposing the area near Palmyra. The report stated that the continuous redeployment of forces between fronts has a negative impact on the overall combat effectiveness of the army. However, Damascus seems to think differently, it notes. As a result, the tactical miscalculations of Syria’s General Staff are being safeguarded with the lives of Russian pilots. Is This the American ‘Plan B’ Washington Has Threatened Russia With? In a separate analysis on the conflict, Semyon Bagdasarov, Director of the Moscow-based Center for Middle Eastern and Central Asian Studies, says that the militants have used the Russian-brokered ceasefire to rearm their units. “During the cessation of hostilities the jihadists have not only recruited new fighters into their ranks but have received modern armament,” he said in an interview with the Russian online newspaper Svobodnaya Pressa. Turkey, he says, was one of the suppliers. For example, he says, a Man-Portable Air-Defense System (MANPADS) Stinger was used by the terrorists to bring down the helicopter carrying the two Russian pilots on July 8 near Palmyra; it was assembled in Turkey under an American license.Syria’s Minister of Information, he says, warned as early as May that the militants had received dozens of MANPADS and that Russia should brace itself for the loss of its aircraft. So here they come. The analyst warns that it will be more difficult to shut the border crossings and clean up Aleppo. He also says that there are many Turkish professional servicemen fighting alongside the Daesh militants. Already half a year ago the Turkish Special Forces were fighting in the frontier zone, and now they have been noticed near Aleppo. “All of this reminds us of the Plan B the US threatened us with,” he said. “The arms supplies to the jihadists have intensified. Let us put in place our mirror-image “Plan B”, he suggested. The expert explained that it might include assistance to the military wing of the Kurdistan Workers Party (PKK), the intensification of arms supplies to the Syrian Army and assistance to the People’s United Revolutionary Movement. The group was only established in May but has already performed well in the fight against Turkish servicemen. When asked whether these shipments could provoke Ankara’s wrath, Bagdasarov replied that it is highly unlikely that Turkey would choose to exacerbate a proxy-conflict with Russia. It itself is nearly on the brink of the civil war and its open interference in Syria might well result in its own collapse, he concluded. A 25 year old from Orenburg, Aleksandr Prokhorenko, has been revealed as the serviceman, dubbed ‘Russian Rambo’ by international media, who died a hero. He called a strike on himself while surrounded by Islamic State during a battle near Palmyra. Authorities in Russia’s Orenburg region confirmed his identity. “This hero was a native of the village of Gorodki in the Orenburg region – 25-year-old Aleksandr Prokhorenko,” the press service of the governor of the region said. Aleksandr had dreamt of joining the military since his childhood, his friends recall, as cited by Orenburg news outlet Orenday. Born into a family of servicemen, Aleksandr and his younger brother Ivan decided to follow in the footsteps of their forefathers. Aleksandr graduated from the Military Academy of the Air Defense of the Russian Armed Forces in Smolensk with honors, sharing photos of his life at the Academy on social networks, always happy and smiling. He subsequently joined the army, where he served under contract. He was rather skinny, but it turned out he had remarkable inner strength. Even Aleksandr’s wife, Ekaterina, at first had ‘no idea’ her husband was going to Syria. They married a little over a year ago and she is expecting their first child. “He was very open-minded, loved life… It seems only yesterday they celebrated their wedding. A year and a half passed. You can’t imagine how happy he was! So in love,” Orenday cites Aleksandr’s friends as saying. Friends say Aleksandr’s parents fear his wife will lose the baby. The entire village is grieving. At his parents’ home, there is a picture of Aleksandr in a black frame next to an icon, as Russian tradition dictates. They say his mother has not stopped crying since the news came in. “I’m sorry, no strength to talk. We do not know how he died. We were told only that it was in combat. This is all very hard for us,” the news outlet quotes Aleksandr’s father as saying. He and his wife are waiting for the body of their son. They want to bury him at home. Hundreds of people from various Russian cities – relatives and friends of the deceased hero – are waiting for the official burial date, in order to come to town and lay him to rest. “I admire the heroism of this simple provincial boy who was able to put his orders and the preservation of his comrades’ lives above his own,” one of Aleksandr’s friends is quoted as saying. The governor of Orenburg region, Yuri Berg, visited the Prokhorenko family to express his condolences. “It’s so hard. It’s impossible to convey the grief of his parents in words. Together we mourn the death of our fellow countryman, his name will remain forever in our hearts, it will be immortalized,” Berg said, adding that one of the streets in Orenburg will be named after the hero, while the administration of his home village also suggested renaming the school Aleksandr went to after him. Aleksandr Prokhorenko called a strike on himself when he was compromised and surrounded by Islamic State (IS, formerly ISIS/ISIL) militants near Palmyra, during a fierce battle between the Syrian Army and the terrorists. “A Russian special operations forces [SOF] officer was killed near the town of Palmyra while guiding Russian warplanes to IS targets,” a military source at Russia’s airbase Khmeimim told Interfax last Thursday. The source added that the special forces operator had been on a mission near Palmyra for at least a week, detecting the terrorists’ most important targets and providing coordinates for Russian warplanes to strike. “The officer died a hero, calling a strike on himself after he was compromised and surrounded by terrorists,” the source added. Russian SOF teams have been on the ground in Syria since the Russian anti-IS operation started last September. Aleksandr Prokhorenko is the fifth Russian serviceman killed during the Syrian deployment, along with Air Force pilot Oleg Peshkov, shot while in the air after ejecting from an Su-24 bomber downed by Turkey. Marine soldier Aleksandr Pozynich was also killed during the search operation to rescue the surviving Su-24 pilot.